Campaign app for one of the largest credit unions in the U.S.
Headquartered in Chicago, Alliant is one of the largest credit unions, which offers banking services including checking, savings, credit cards, auto loans, mortgages, personal loans, insurance plans, and investment services. One of the main challenges of the company was to showcase benefits of banking with Alliant at any event and get the leads. So, they needed an event based marketing app to take down the details of its potential members at the event. Softweb Solutions developed a lead gathering app using Xamarin. This enterprise app is used by the organization’s business development and branch teams to collect leads at various events. 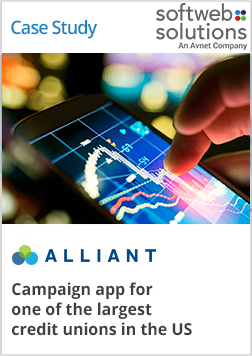 This iPad app helped Alliant with branding, data collection and revenue generation. Main menus - ATM locator, rates, online banking, mobile banking, calculator, special offers, etc. Kiosk mode – Customers enter the information and executives of the company review it after the event. Lead mode – Employees of the company fill in the information.